3.4ft magnetic charging cable with a charging stand. 2 in 1 unique design with reasonable price.The Apple watch charger module and the stand re included in the package that need not to buy another iWatch stand or charger. Apple MFi Certified that perfectly fit all size and models of Apple watch. Series 3 2017, Series 2 2016 and Series 1 2015 Version (38mm and 42mm Basic, Sport or Edition Models). Made from a durable TPU material with a Non-Slip Base. Which is sturdy but also lightweight and compact. It is convenient use in the home or office or trips. Support all apple watch bands charging: broader strap, Sports Bands, links band, metal band etc. PLEASE NOTE: Both the Apple Watch Stand and the Built-in Charger Module are included. 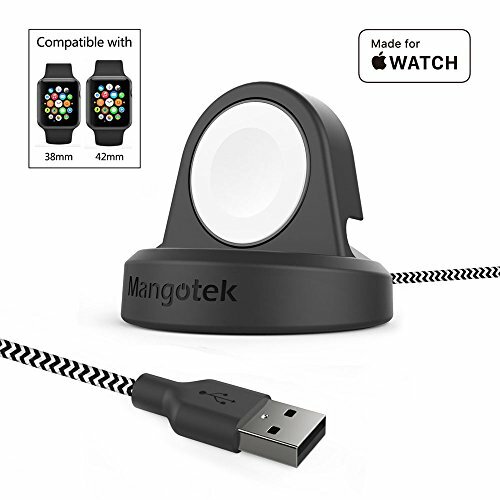 If you have any questions about this product by Mangotek, contact us by completing and submitting the form below. If you are looking for a specif part number, please include it with your message.